A fighter typically punches their own unemployment ticket after losing three straight scraps inside the Octagon. 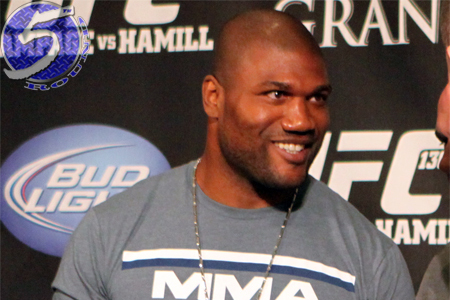 However, it appears UFC president Dana White might still be interested in re-signing former champion Quinton “Rampage” Jackson (Pictured). The 34-year-old essentially completed his contractual obligations with the promotion following Saturday’s unanimous decision defeat to Glover Teixeira. Although, there is some fine print at the bottom of Rampage’s contract that allows the UFC to match any offer that comes across his table. “First of all, Rampage has lost three in a row. He wasn’t very nice to us leading up to the last fight,” White expressed on UFC Tonight. “Despite the whole thing, I don’t dislike Rampage. Through all that crap leading up to what happened, I treated Rampage the same as we always have. Rampage has spent that past several months publicly bashing the UFC, telling anyone and everyone how they have disrespected him. The controversial slugger owns a 32-11 professional record. He has gone just 7-5 under the UFC’s watch. Prior to Saturday’s outing, White claimed Rampage made $15.2 million during his tenure with the planet’s premier MMA promotion.